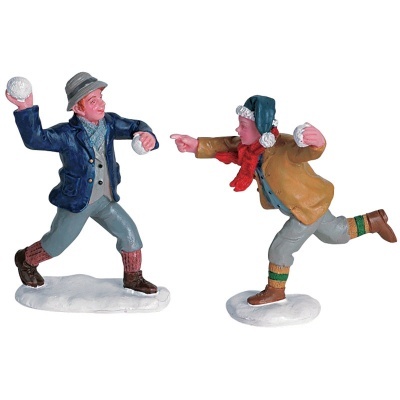 Lemax Snowball Figurines (Set of 2) depicts two young boys having fun outside in the Winter snow, launching snowballs. Seasonal Lemax Village miniature two piece set which joined the Caddington Village themed range in 2006, suited for placement in a Winter or Christmas Lemax display. The Snowball Fun set comprises of two individual hand painted polyresin figures on individual snowed bases to compliment your seasonal Lemax Village Christmas display.